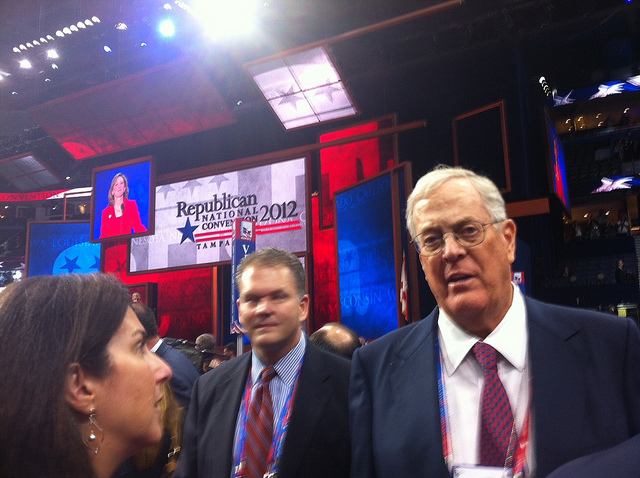 David Koch, one-half of the hugely influential Koch brothers duo, was not hard to miss on the floor of the Republican National Convention. A former collegiate basketball player at MIT, Koch stands six-foot-five, a giant among the party faithful. He looks identical in person to the hundreds of photos of him just a Google search away. Koch is one of New York’s 95 delegates, all Romney supporters, and his presence here at the GOP convention has caused a stir. Koch’s private dinner with Sen. Ron Johnson (R-Wis.) on Monday night ended up plastered all over Twitter, breeding rumors and speculation about who else dined with the man the liberal blogosphere loves to hate. I’m deeply honored and humbled to be chosen as one of 95 delegates representing the great state of New York at the 2012 Republican National Convention. As I read the statement, a few pink-cheeked convention pages approached Koch, asked him for some life advice. “I’m the evil billionaire Koch brother,” he quipped. “You’re not afraid of me?” They weren’t. As best as I could hear over the convention floor din, Koch, leaning down so the pages could hear, urged them to specialize in something they enjoyed and then work like hell to master their craft. Be the best at whatever it is you choose to do. The pages nodded in unison. Koch looked happy. The New York delegation was seated next to Wisconsin. That meant Koch and Wisconsin Gov. Scott Walker, who famously took a call from a fake “David Koch” during Wisconsin’s 2011 uprising (“thanks a million!”), stood just 10 or 15 feet apart for much of the evening. I never saw Koch or Walker exchange words. But then Walker is a celebrity at this convention, in demand from anyone within arm’s reach. Koch’s aides—Bill O’Reilly, a New York politico and Newsday columnist; Cristyne Nicholas, a Manhattan-based political communications consultant; and Nancy Pfotenhauer, a DC political strategist and former Koch Industries lobbyist who worked on John McCain’s 2008 campaign—politely shielded their man from reporters. On stage, New Hampshire Gov. John Sununu took the mic to officially nominate Mitt Romney for the Republican presidential candidacy. Koch and his entourage took their seats with the rest of the New York delegation as each state proudly rattled off the number of delegates it had elected for Romney. (Delegates for other candidates, such as Rep. Ron Paul, were not recognized.) Then, when it was New York’s turn, New York GOP chair Ed Cox stepped up to the mike and committed all 95 of New York’s delegates to Romney. A pack of photographers encircled Cox as he stood at the New York delegation’s designated microphone. Koch stood just behind Cox’s left shoulder, clapping, smiling, and looking on approvingly like a proud brother or father. It was unclear whom the photographers cared about most—Cox or Koch. Next up was North Carolina. New York’s delegates returned to their seats. But Koch lingered on his feet a bit longer, gazing toward the Frank Lloyd Wright-inspired convention stage. Then he, too, sat back down, just another face in the crowd.